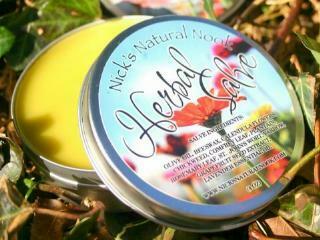 Herbal Healing Salve from our sister company, Nick's Natural Nook, formulated for all types of skin irritations which are so common, something we all experience from time to time. This salve is made by us and is so versatile – you only need to have this one salve on hand for many skin conditions. This truly miraculous salve is a blend of all natural ingredients designed to heal and comfort your skin! Click on the product for more info!